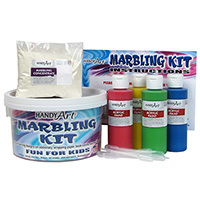 Handy Art® offers several kits to explore and expand the artistic imagination! Handy Art® Fabric Paint opens up endless possibilities of creativity on fabric projects. Works on natural and most synthetic fabrics and can be applied directly from bottle tip or brush, stamp, sponge, block or screen printed. Dries to a soft, flexible finish. Heat setting with an iron is required for a permanent and washable finish. Complete instructions included. Clean up with soap and water. Water based and Certified AP Non-Toxic. Handy Art® Tie-Dye Kits are a fun way to create vivid and bright retro designs on all your natural fabric projects. Our Handy Art® Bucket Kit contains pre-measured red, yellow, and blue dye in applicator bottles, an extra applicator bottle for mixing secondary colors, pair of gloves, rubber bands, dye activating compound and complete instructions with tying ideas. Dye up to 15 adult size t-shirts. For ages 12 and up. Adult supervision is advised. 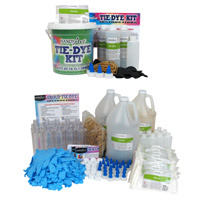 Our Handy Art® Class Pack Kit contains pre-measured red, yellow and blue dye in gallon jugs, 15 applicator bottles, 9 secondary color mixing bottles, 21 dispenser caps, 15 solid caps, 25 pairs of gloves, rubber bands, 8 bags of dye activating compound and complete instructions with tying ideas. Dye up to 200 adult size t-shirts. For ages 12 and up. Adult supervision is advised. Discover the art of marbling and create beautiful, bright and unique swirling patterns of color on stationary, wrapping paper, clothing and more. It all starts with a thickened solution of water, floating drops of diluted paint and gently created patterns which are then transferred to your project. Kit contains 4oz/118ml bottle each of Brite Red, Chrome Yellow, Light Green and Phthalo Blue Handy Art® water based Acrylic Paint, enough marbling concentrate to make 15 quarts of suspension liquid, 8 pipettes and complete instructions with pattern ideas. A fun activity for all ages! Certified AP non-toxic. 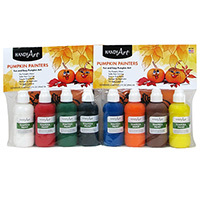 Handy Art® Pumpkin Painters are a fun, safe alternative to carving. Available in 8 spooky colors. Create Halloween designs on pumpkins or windows. Soap and water clean-up. Pumpkin not included! Pumpkin Painters markers are certified AP non-toxic.